DONETSK, Ukraine -- Russia is sending a convoy of more than 100 vehicles with what it says is humanitarian assistance to rebel-held territory in Ukraine, drawing accusations from the authorities in Kiev that it’s aiding separatists. 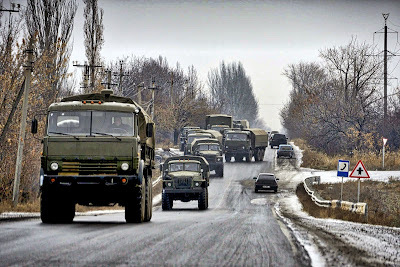 A military convoy of about 30 trucks without license plates coming from the east moves on the road on November 29, 2014 in Chartcizsk. The dispatch marks the eighth such mission since August by Russia, which says it’s acting to mitigate the humanitarian suffering caused by the unrest. Ukraine has called the convoys an invasion and blamed Russia for the toll on civilians. The repeated sight of trucks covered with white tarpaulins crossing from Russia underscores Ukraine’s loss of control over parts of the border amid its bloodiest conflict since the Second World War. Ukraine has expressed concern that the Russian relief missions are a guise for funneling weapons and reinforcements to insurgents. The humanitarian crisis is worsening as the government in Kiev moved to cut off funding and services to the two breakaway regions, according to the United Nations. “An escalation of military activities has aggravated the security situation in the region, and led to increased uncertainty and fear among the population,” the UN Office for the Coordination of Humanitarian Affairs said on its website. The UN estimates that more than a million people are internally displaced or fled to neighboring countries as a result of the strife, with 5.2 million still living in areas engulfed by the conflict. A cease-fire negotiated on Sept. 5 in Minsk, Belarus, has failed to take hold. Ukraine and its allies blame Russia for stoking the months-long conflict that’s killed more than 4,300 people and left more than 10,000 wounded. The government in Moscow denies involvement. To keep up pressure on the pro-Russian separatists, the European Union yesterday extended asset freezes and travel bans to a further 13 persons and five entities it said were involved in actions against Ukraine’s territorial integrity. The people include officials in the breakaway republics of Luhansk and Donetsk and those linked to organizing Nov. 2 local elections denounced as illegitimate by Ukraine and its allies. Fighting in the conflict zone left one civilian dead yesterday after rebels shelled areas around the regions of Donetsk and Luhansk, Ukraine’s Ministry said yesterday. Militants also attacked government troops, prompting them to return fire, it said. One soldier was killed and 11 hurt, according to Volodymyr Polevyi, a military spokesman in Kiev. The self-declared Donetsk People’s Republic said it’s awaiting the arrival of Russia’s relief mission today, which is ferrying food and construction materials, according to a statement. The cargo consists of more than 1,200 metric tons of materials, RIA Novosti reported, citing an official at Russia’s Emergencies Ministry. Russia notified the Ukrainian Foreign Ministry about the planned delivery, separatist authorities said. “The humanitarian situation remains very tense,” the Donetsk republic said yesterday on its website. Ukraine’s military spokesman, Polevyi, countered yesterday by saying that rebels continue to refuse humanitarian help from Kiev. Ukraine estimates that Russia has sent some 950 KamAZ trucks as part of its humanitarian convoys since August and suspects many of them were half-empty or carried weapons, according to Polevyi. While most aid doesn’t reach the civilian population, infighting is breaking out among rebels for control over humanitarian flows, he said. “Ukraine continues to base its policy toward eastern Ukraine on the Minsk agreements,” Polevyi said.